As October approaches, I feel compelled to cook. Perhaps it’s the chill in the air that drives you inside and to simultaneously open the windows to enjoy the smell of fall air. Maybe it is the incredible bounty of in-season produce that will only be this delicious for a few weeks. I think that both are contributing factors, coupled with the concept of slowing back down as cooler weather sets in and there are fewer places to be, giving you the time to stay in the kitchen all day, and cozy up with the rewards of the day on the sofa, wrapped in a blanket, by night. That is the essence of fall to me, and I believe that’s why I feel an overwhelming desire to be in the kitchen every year about this time. It also cannot be coincidence that fall is also my favorite season. This fall, as October approaches, figs are in season (a perennial favorite of mine) as are squash and apples, which conform so well to comfort food. You know, those foods that stir your soul and evoke moments of nostalgia that at once make you remember a moment in time and feel content. For me, it spices – cinnamon, nutmeg, cloves, allspice. I am, after all, my mother’s daughter, and my mother is a cinnamon fanatic. Truly. If a recipe calls for cinnamon (or fennel seed or black pepper) you can guarantee that she’s doubled, if not tripled, the amount the recipe calls for. Though I often follow in her footsteps, sometimes it’s the faint aroma that can trigger happiness. So where am I going with all of this? 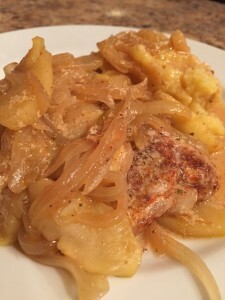 Well, the perfect dish includes pork chops, onions, apples, and cinnamon to produce a savory dish perfumed with the essence of fall: apple cider braised pork chops. Not only is it magic, it’s healthy, too. Combine the spices together on a plate, and spread into an even layer. Coat each side of the chops evenly; set aside. Heat a deep frying pan with a bit of oil, add the onion and sauté until lightly browned; set aside on a plate. Add a bit more oil and brown the chops on each side. The goal is just to develop some color and flavor; they will finish cooking later. Remove to plate with onion. Return pan to medium heat and add the vinegar and cider, deglazing the pan. Then return the onions and chops to the pan. Place the apples on top of the chops. Pour in the broth, around the edges – you don’t wash to wash off the spices on the chops. Cover, reduce to low heat, and simmer for approximately 10 minutes, until chops are cooked. If it comes to a boil, reduce the heat more. Transfer the chops, onion and apple to serving platter. Raise the heat, add the milk, and boil until liquid is reduced by 1/3, about 5 minutes. Pour sauce over chops and serve.